The biggest day for online retail sales among Littledata’s clients is the Sunday after Black Friday, followed closely by the last Sunday before Christmas. 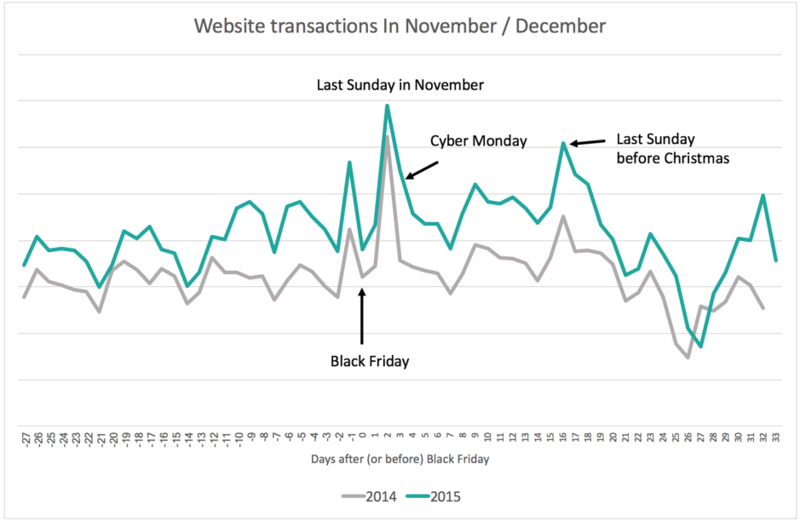 Which is more important – Black Friday or Cyber Monday? Cyber Monday saw the biggest year-on-year increase in daily sales, across 84 surveyed retailers from the UK and US. In fact, Cyber Monday is blurring into the Black Friday weekend phenomenon – as shoppers get used to discounts being available for longer. We predict that this trend will continue for 2016, with the number of sales days extending before and after Black Friday. Interested in what 2016 will bring? Stay tuned for our upcoming blog post! Want to see how you did against the benchmark? Sign up for a free trial or get in touch if you have any questions!